Valverde wins the sprint from the front, denying Bardet, Woods and Dumoulin in attritional race that fractured on leg-breaking final climb. 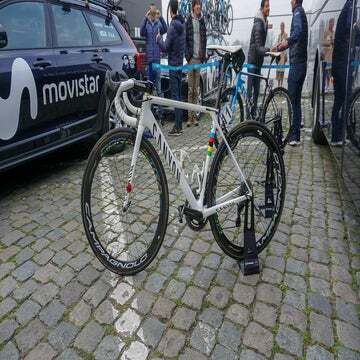 Alejandro Valverde (Spain) took the world title after leading out the final four players in an attritional 265-kilometer race in the Austrian mountains. Romain Bardet (France) and Michael Woods (Canada) took second and third, having been unable to come around the Spaniard in the final kilometer. Tom Dumoulin took fourth after a brave solo chase to the leaders in the final kilometers. “It’s just something incredible,” said Valverde. “There are so many years fighting, fighting, and finally, I achieved it. The race kicked off almost from the gun, with two breaks going clear and joining forces after around 20km of racing. The break was made up of Robert Britton (Canada), Tobias Ludvigsson (Sweden), Kasper Asgreen (Denmark), Conor Dunne, Ryan Mullen (both Ireland), Daniil Fominykh (Kazakhstan), Vegard Stake Laengen (Norway), Karel Hnik (Czech Republic), Jacques Janse Van Rensburg (South Africa), Ilia Koshevoy (Belarus), and Laurent Didier (Luxembourg). The break stretched out their gap to 19 minutes by the summit of the Gnadenwald, the first climb of the day, however, 200km remained and the peloton was calm. As the race entered the first of the route’s six laps – each of which included the Igls climb – Great Britain, Slovenia, Austria, and France took to the front of the bunch, controlling the pace. The Spanish, French, and Polish kept close to to the front, but didn’t contribute to pacemaking. As the kilometers ticked by, the difficulty of the mountainous route became evident, and riders constantly slipped off the back of the peloton. Likewise, the break started fatiguing, and the once-cohesive unit lost Mullen, Dunne, and Didier on the third ascent on the Igls. Warren Barguil (France) hit the deck and pulled out on 100km, marking a blow for the French team, and shortly after, Peter Sagan (Slovakia) dropped out of the bunch, the constant climbing too much for him. With 80km to go, the gap was down to seven minutes as the pace in the bunch notably increased, driven by GB and the Spanish. By the top of the fourth climb of Igls, the break was down to four; Laengen, Britton, Asgreen, and Van Rensburg. With 200km down and 65km remaining, the race started hotting up, with Dario Cataldo (Italy), and Jesus Herrada (Spain) launching from the peloton. Shortly after, dangermen Vicenzo Nibali (Italy), and Michal Kwiatkowski (Poland) bridged. They gained several seconds, but the Russian, GB, Spanish, and French teams soon brought them back. The next attack came from Greg Van Avermaet (Belgium), with Damiano Caruso (Spain) and Omar Fraile (Italy) soon joining him. With 50km and one lap of the Igls remaining, all the main contenders were still present bar Sagan and Barguil, with Primoz Roglic (Slovenia) chasing hard after an earlier crash. The Van Avermaet group were 20 seconds in front of them and working well, with the break down to four minutes. With only 45km remaining, flurries of short-lived attacks kept going off the front, with Germany, Italy, and France particularly active. This upping in pace bought back the trio of Caruso, Fraile, and Van Avermaet, and shelled Dan Martin (Ireland), Wout Poels (Netherlands), Kwiatkowski, and Simon Yates (GB). Up front, the original break was down to two, Asgreen and Laengen. As the race started approaching the final ascent of the Igls, the two leaders, who had been out front all day, were still over two minutes in front. The Italian team, still totally intact, took to the front on the climb, taking control for Gianni Moscon and Vicenzo Nibali. The Dutch, Spanish, and French kept close behind them in a bunch now down to around 60 riders. On 24km to go, Steven Kruijswijk (Netherlands) went clear, briefly breaking the rhythm of the race, though the bunch soon came back together. The change in pace was enough to drop several from the group, notably Nibali and Van Aevermaet. With 2km remaining of the last ascent of the Igls, the two remaining riders in the break were finally swallowed up. Peter Kennaugh (GBR) attacked hard as the race approached the top of the climb, but soon faded. However, his acceleration drew out Michael Valgren (Denmark), who went over the summit with a decent gap. On the descent, several riders including Rui Costa (Portugal), Moscon, Thibaut Pinot (France), and Roglic lead the chase. Up front, Valgren had taken 30 seconds and looked comfortable, with just the steep Holl climb remaining. In the run into the Holl, the French and Dutch teams chased hard, with the latter still boasting a strong number of riders. As the narrow, brutal climb kicked in, the bunch shattered, with the Frenchmen Julian Alaphilippe and Pinot at the front, along with Valverde, Woods, and Moscon. Alaphilippe soon went backward, whilst Woods, Bardet, Moscon, and Valverde caught and dropped Valgren. Behind, Tom Dumoulin (Netherlands) chased hard. Woods went over the summit of the Holl first having set a fearsome pace, whilst Moscon went off the back. The race was now led by Woods, Valverde, and Bardet, with Dumoulin not far behind. On the descent, the lead trio watched each other, none of them willing to commit. With 2km to go, Dumoulin’s furious chase paid off, as he made contact with the leaders. In the final straight, Valverde led out the sprint, and stayed strong to the line, with Woods attempting to come around him but lacking the legs, and Dumoulin hesitating at the back. “It was a long sprint and they put all the responsibility on me. When we got to 300m, I said, this is my distance. I went full-gas and finally I could achieve this victory,” said the tearful winner.